OTech: HIMSSLA in Sao Paulo: Latin America is catching up. HIMSSLA in Sao Paulo: Latin America is catching up. The exhibition floor was quite busy. I like the international HIMSS meetings much better than the big USA-based ones. 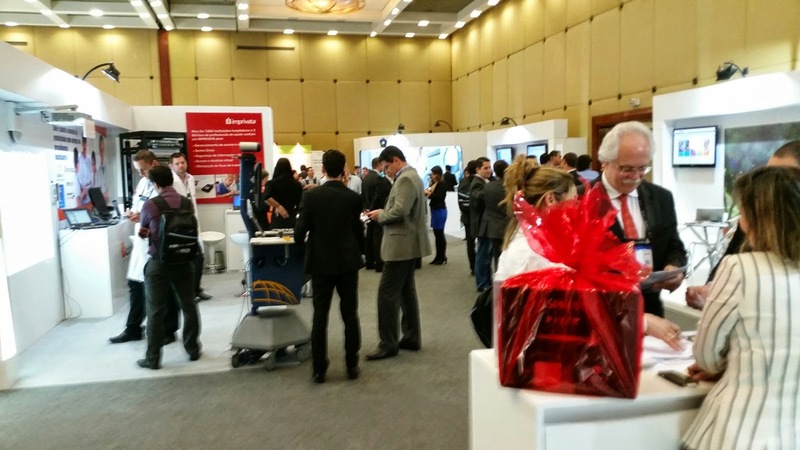 Take for example HIMSSLA, which was held on Sept.18 and 19 in Sao Paulo, Brazil. The attendance was small, probably 500 or so, but the speakers were top notch and the attendees were definitely the local top decision-makers and movers and shakers in industry and government. If nothing else, the hotels are better and less expensive compared to Chicago, for example, and the food is the best (don’t get me started on the excellent Brazilian coffee). Of course it is a little bit further than Chicago, but an eight hour direct international flight is not bad at all and priced not that much more than a domestic flight in the US. Latin America is definitely catching up, during the conference, HIMSS presented two awards to hospitals that achieved stage 6 status in the HIMSS Analytics EMR adoption model. These hospitals are working on getting to stage seven already, so there is great progress being made with implementing EMR technology. The Brazilian government in 2011 set requirements for interoperability standards such as IHE XDS, PIX/PDQ and a couple others so there is a big emphasis on interoperability. However, there is still a lot of education and learning to be done about connectivity and there are still hurdles to overcome, but the intention is clearly there and the activity at the HIMSS showed that people are serious about it. As I mentioned, there were top notch speakers both from the US, such as the executive director of Kaiser Permanente, the CEO of the New York eHealth collaborative, and global director of health from Accenture, but also from Latin America. It is always very motivating to see how these leaders see the future of healthcare evolving and how they implemented healthcare IT to achieve major improvements in quality and patient care while also reducing cost. Of course, there is still a certain amount of crystal ball gazing when thinking about how healthcare delivery might change over the next five to 10 years, but hearing how these leaders see the impact of social media, mobile health and home health is encouraging. One thing is clear, the care of a patient does not stop when he or she leaves a hospital, rather, it is when it continues by following up with phone calls, emails between physicians and patients, tele-consultations, uploading of personal data such as weight, blood pressure, glucose meter readers, and even pacemaker recordings into Personal Health Records often on a daily basis. That is how re-admissions can be prevented and how real, fundamental improvements can be made in the care of patients. were also made by being able to mine the data from the EMR and share it back with not only the decision- makers, but more importantly, with the people on the frontlines (physicians, nurses, care coordinators, etc.) so they can see how to make an impact. Larry Garber from Atrius Health in Massachusetts showed that his organization typically spends $10,700 on patient healthcare costs through EMR implementation and using tools to mine and share the data, compared to the Massachusetts average of $13,000. Similarly, Accountable Care Organizations (ACO’s) in the US have saved $500 million so far, and this is just the beginning. There is still a lot of work to be done but it is clear that investing in healthcare IT pays off when done well and smartly. In conclusion, I definitely recommend attending one or more of the international conferences, the smaller scale makes it much more effective and less tiresome, and again, the venue’s are great! I know I’ll be in Brazil next year again for sure! Well, I did not know about the tradition of the Latin America but I heard about it. This blog is all about the traditions of the Latin America and all the information is so well about dissertation writing tips that is easy to understand. Thank you for sharing this wonderful blog and informative news. IHE XDS Implementation Issues Part 1.